Collaborative research made possible by an international partnership agreement between the University of Maryland and the Autonomous Province of Trento, Italy, has resulted in publication in a major journal. The paper, "Integrating artificial with natural cells to translate chemical messages that direct E. coli behavior," appears in the May 30, 2014 edition of Nature Communications. The research into controlling living cells through communication with artificial cells was conducted by the research groups of Professor Sheref Mansy at the Centre for Integrative Biology, University of Trento; and Robert E. Fischell Distinguished Professor William Bentley, chair of the Fischell Department of Bioengineering (BioE) at the University of Maryland. A graduate student exchange program was an important part of the research. 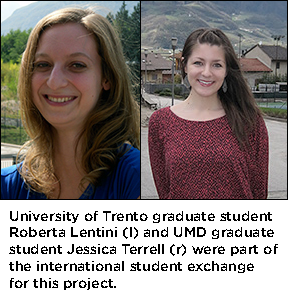 Maryland grad student Jessica Terrell (BioE) spent several months in Trento working in Mansy's research group, and Mansy sent his advisee, University of Trento graduate student Roberta Lentini, to work in Bentley’s Biomolecular and Metabolic Engineering Laboratories in College Park. Lentini developed an artificial cell that can respond to a quorum sensing signal [molecule], autoinducer-2, while Terrell built one that can synthesize and deliver autoinducer-2. Lentini is first author on the resulting paper. While previous efforts to control cellular behavior have largely relied on various forms of genetic engineering, modifying the genetic content of a living cell often changes the behavior of that cell. Recognizing this, the research group set out to construct a system whereby artificial, nonliving cellular mimics could be engineered to activate or prepress already-existing natural sensory pathways of living cells through chemical communication. To do this, the team of researchers worked to engineer Escherichia coli by targeting its sensory pathways. To avoid altering the genetic content of the bacterium, they constructed artificial cells that could interact with natural cells in order to evoke a behavioral response. As a result, the artificial cells release a molecule to which E. coli can naturally respond, thereby translating an unrecognized chemical message into a recognized chemical message, the group noted. To illustrate the significance of the group’s research, Mansy broke down what sets their system apart from those that rely on modifying the genetic content of a living cell. Next steps include research of applications that could benefit from artificial cells, especially therapeutic or remediation strategies for maintaining and restoring natural stasis, Terrell noted. The international partnership, administered by the Institute for Systems Research, funded projects in solar power and ultra-low power systems in addition to the cell-based systems research. In addition to Terrell and Lentini, five additional graduate students have participated in exchanges in the past year. It is not always necessary to genetically engineer living organisms to carry out desired activity. Instead, we can engineer nonliving, artificial cells to do many of the things that we are after. And, by doing so, we also bypass many of the problems that people have with living technologies.